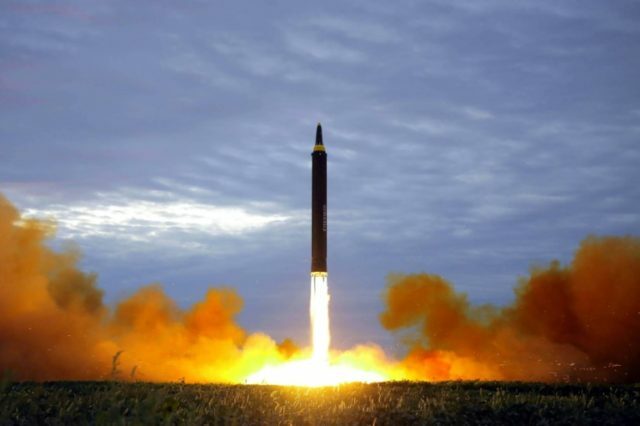 Hong Kong (AFP) – Asian markets sank and safe-haven assets rallied Tuesday as US-North Korea tensions flared up again after Pyongyang accused Donald Trump of declaring war on the country and said it would shoot down US bombers. Foreign Minister Ri Yong-ho’s comments came at the United Nations in response to the tycoon’s warning on Twitter at the weekend that North Korea “won’t be around much longer” if it keeps up its threats. Ri said the regime of Kim Jong-Un had “every right to take counter-measures including the right to shoot down US strategic bombers even when they are not yet inside the airspace border of our country”. The comments — described by the White House as “absurd” — are the latest in a war of words between the two sides following the North’s recent nuclear test and missile launches. While most analysts do not expect the crisis to lead to a nuclear conflict, China and Russia have been among the countries to express alarm. “This does represent a significant escalation in rhetoric and raises the risk of a tactical misstep,” Tapas Strickland, a Sydney-based economist at National Australia Bank, told Bloomberg News. And the concerns are being felt on financial markets, with safe investments rising. Gold was up more than one percent, while the Japanese yen recovered recent losses against the dollar. Tokyo’s Nikkei index ended the morning 0.1 percent lower, while Seoul shed 0.1 percent, Hong Kong shed 0.2 percent and Shanghai retreated 0.1 percent. Sydney, Singapore and Wellington were also in the red. On currency markets the dollar struggled to recover from its New York losses and was sitting around 111.60 yen, well off the levels around 112.50 yen seen in Tokyo earlier Monday. Adding to the greenback’s weakness were conflicting comments from top Federal Reserve officials over the timing of the bank’s next interest rate hike. The euro was also on the back foot after European Central Bank boss Mario Draghi’s aired concerns about the unit’s recent strength and hinted that policymakers could keep monetary stimulus for some time as the eurozone economy recovers. And while German Chancellor Angela Merkel won a fourth term as leader of Europe’s biggest economy, her falling share of the vote and need to build a coalition government have left investors uneasy. However, energy firms were mostly higher as oil prices surged Monday after Turkish President Recep Tayyip Erdogan threatened to block the key crude exports from Iraq’s Kurdish region, which is holding an independence referendum. Brent jumped nearly four percent to its highest level since July 2015, while US benchmark West Texas Intermediate piled on three percent. However, the two contracts were mixed in Asian trade.